Unmanned aerial systems (UAS) are demonstrating their value for capturing high-resolution aerial imagery and 3D terrain content for GIS and other uses. However, the wide variety of hardware, software, and regulations related to UAS can be baffling. If you want to start exploring the use of UAS for GIS, this brief explanation will get you off the ground. As defined by the Federal Aviation Administration (FAA), UAS consists of the unmanned aircraft (UA) or drone and all the associated support equipment, control station, data links, telemetry, communications, and navigation equipment necessary to operate the UA. 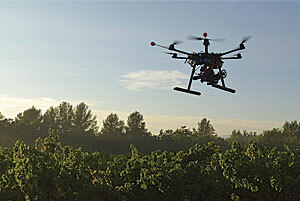 In UAS, the unmanned aircraft is often referred to as the platform. Platforms consist of both fixed-wing and rotary-wing (rotorcraft) aircraft. Each platform has its own strengths and weaknesses. Many users start off with inexpensive consumer-grade rotorcraft. These aircraft allow them to more easily become familiar with the workflows and techniques involved with basic data capture. Most rotorcraft can manage only 15 to 20 minutes of flight time on a full charge, but batteries can be swapped out and the survey resumed. Rotorcraft are easier to operate, thus requiring a minimum of training. The short duration of their flights makes them suitable for project areas that range from 1 to 100 acres. Many rotorcaft operators upgrade to fixed-wing platforms for larger surveys. In general, fixed-wing aircraft commonly have flight times of 45 to 90 minutes, or roughly twice the duration of rotorcraft. In addition to covering hundreds of more acres in a single flight, a fixed-wing aircraft can often carry larger cameras and equipment and handle challenging weather conditions. However, they are considerably more complicated, expensive, and require more training to master. This aspect of platform choice cannot be underestimated. A GIS manager at a pipeline company recently shared the story of an overconfident radio control (RC) pilot who had convinced his boss to purchase a UAS on the basis of his many years of RC airplane aerobatic experience. The first day—while company representatives watched—he flew the company's new $80,000 drone into the ground and smashed it to smithereens. The payload that a UAS carries is determined by the project requirements and limits of the platform. Digital RGB cameras are the leading sensor type, ranging from inexpensive GoPro cameras to high-end digital SLR cameras with quality lenses. GoPro cameras are popular because of their price but have some drawbacks. Their fish-eye lenses add curvature to imagery. This isn't ideal for aerial photography because lines need to match up when creating a mosaic. Designed for sports photography, their focus settings are fixed at medium range to catch action in that range, rather than at infinity—the setting needed for long-range capture. As a result, imagery is often slightly out of focus at altitudes between 200 and 400 feet, where the UAS would usually be flown. However, GoPros are lightweight and inexpensive. There are also specialized sensors for agriculture, wetlands analysis, and environmental monitoring. These are multi- or hyperspectral sensors that allow analysis of vegetation or wetlands through the use of remote-sensing software. Many of these sensors are now small enough to be carried on either platform. Another sensor type is full-motion video (FMV), a special geoencoded video taken with cameras that output files in Motion Imagery Standards Board (MISB) standard video format. Videos in this format can be overlaid and viewed in GIS in either real time or recorded mode using the ArcGIS Full Motion Video Add-In. In the past, these sensors were marketed to military and law enforcement and were too expensive for most GIS users. Now lower-priced FMV sensors are becoming available. Several commercial off-the-shelf photogrammetry programs can process UAS imagery and flight logs into orthomosaics [collections of contiguous aerial photos that have been geometrically corrected to remove image distortion] and 3D point clouds. Evaluate them with sample imagery before choosing one. Capture technique and GPS ground control have a huge impact on the quality of resultant output. Get some training or learn from experienced users to avoid wasting time using a flawed methodology. Requirements for processing can be demanding on hardware depending on the number of images being processed per batch. Most software and hardware currently available will easily handle 100 to 200 images. Projects involving thousands of images will require increasing hardware processing, graphics, and memory capabilities. UAS content can be delivered via traditional means, such as USB hard drive, but GIS users are increasingly using cloud delivery services such as Dropbox. Many customers are now receiving data through ArcGIS Online, which also gives non-GIS users access to the data through web maps that display on any client. Regulation of UAS is in flux and can vary significantly by location. UAS operators need to comply with FAA (federal), state, and possibly local regulations. The FAA handles everything to do with air safety. Until permanent regulations are in place, the FAA has instituted an interim process for professional UAS operator authorization called the 333 Exemption. To obtain this exemption, organizations must submit system and operational information and specify how they intend to safely operate a UAS. In doing so, operators are requesting exemption from several FAA rules including the ban on commercial operation without a commercial pilot's license. All organizations using UAS in a professional capacity, even if not offering as a service and even if for in-house use only, are required to obtain a 333 Exemption prior to operating. Hefty fines—as much as $1.9 million—have been levied against companies operating without FAA commercial authorization. The exemption provides a blanket authorization as long as several key provisions are met. The main condition is that a licensed pilot, with at least a Sport Pilot Certificate, operates the UAS, but a commercial license is not required. This requirement ensures that the operator is aware of existing FAA air space and related flight safety regulations. Other layers of regulation include state and local government restrictions that usually have more to do with privacy than safety. These vary by state, and some municipalities have passed local ordinances against UAS operations. There are no-fly zones around airports, national parks, government facilities, and critical infrastructure. Prior to flight, any temporary flight restrictions (TFRs) or Notes to Airmen (NOTAMS) that the FAA may have issued should be confirmed. In January 2016, the FAA released the B4UFLY smartphone app for iOS that tells users about any restrictions on the air space in which they wish to operate. A version for Android smartphones is in beta. Although there is a lot to learn before taking to the skies, UAS can be a cost-effective way of capturing quality GIS content. For more information, visit www.waypointmapping.com or www.flightlinegeographics.com. Devon Humphrey is a longtime GIS user, instructor, and system architect of Esri technology. He has worked in state and local government at the Esri San Antonio regional office and as an Esri partner with a special focus on emergency management. Since 2007, Humphrey has worked on federal government and university research projects for wildfire modeling, FMV, and other applications of UAS. He was the geographic information officer (GIO) and architect of the GIS common operating picture for the 2010 Deepwater Horizon oil spill in the Gulf of Mexico response effort. As an instructor at the Texas A&M National Spill Control School for the past 21 years, he has promoted the use of GIS and emerging technologies, including UAS, for disaster response to all hazards. He can be reached at devon@flightlinegeographics.com.